See the eTownie and eCortina at the Oxnard “A” Street Car Show on Saturday, March 9, 2013 | 1 p.m. to 5 p.m. 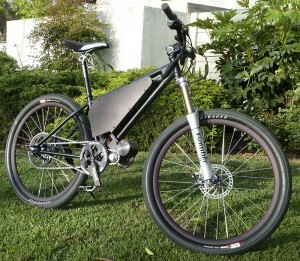 The eTownie is your luxury eBike ride – sweet as can be – you come away with that now famous eGRIN! The eCortina, my eBike hot rod, is a real hand full. It has seen about 3 major variations over the last several years. Topping out at over 50mph in one previous incarnation, it is currently geared for over 4omph. Careful now or the front wheel WILL head for the moon. Presented in association with The Murphy Auto Museum. Featuring classic and specialty cars from a variety of eras. Downtown restaurants will be offering special “to go” foods you can take along while you walk along A Street viewing the cars. This event is open free to the public. Today I completed the eTownie, a geared hub motor eBike. I never thought I would build a hub motor eBike…but…I did and it’s stunning. Click the eTownie link above for more photos and info. I can make one for you. My new project features a new drive system of my design and a cruiser frame. To see build progress, click the photos link above. The new Turnigy motor will be rewound to make it easier on the controller. 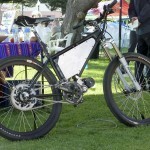 Should be a reliable stable mid performance eBike. More as I move through this build. We thank the Bicycle Design Blog for another notice of the eCortina. The eCortina was featured in the May 2011 edition of the Electric Auto Association magazine CurrentEVents. 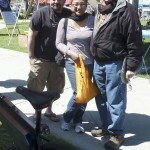 Lots of pics and info on my electric bike. Just got all my aluminum parts back from the metal finisher! Click the projects link above for more pics. 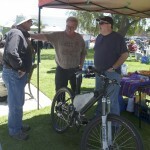 Oxnard Earth Day was a great success for the eCortina. Many people stopped by and paid copious compliments to the design, creativity and workmanship. I was especially pleased to see friends and family support my efforts. All in all a very satisfying event and the official public debut of the eCortina. Many thanks to City Corps for providing an unexpected canopy and for their smooth running of this event. And thanks also to Trish Honigsberg for all her hard work! 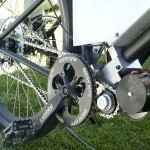 eCortina rear drive setup – larger sprocket for motor drive and smaller sprocket for human power. 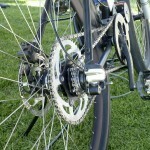 3 speed Nexus internal hub. eCortina motor and primary reduction. 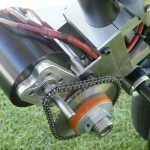 The orange part is a torque-limiter. Roy talking to in interested party. 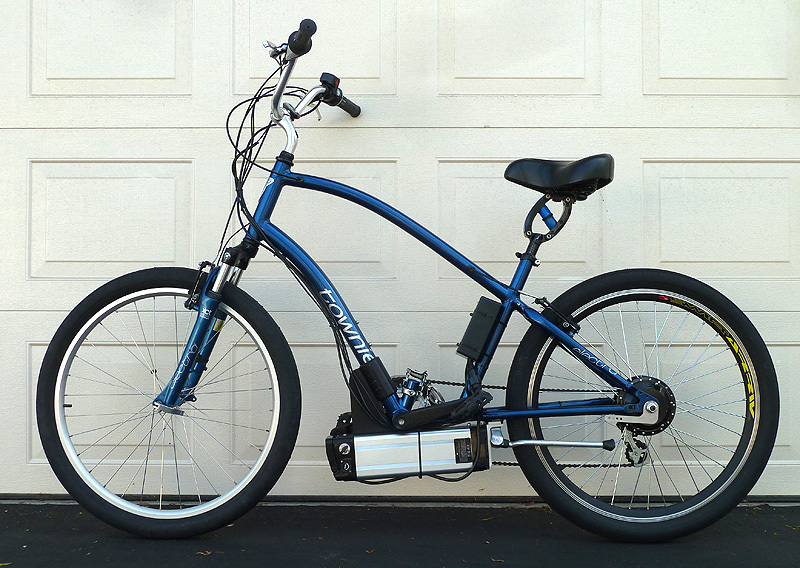 My commitment to myself was to finish my latest electric vehicle project, the eCortina v2, by Earth Day. This is the second time I have used Earth Day as motivation to get an electric vehicle project completed. In 2008 my friend Sri and I set out to do a electric motorcycle conversion but were just not getting to it. So at the end of the year we set the goal of having our eNinja completed by Earth Day 2009. We made our deadline and each of us completed a bicycle project as well. 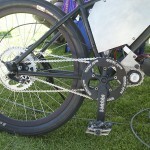 Sri fitted a Bob bicycle trailer with electric creating in effect an electric trailer pusher. 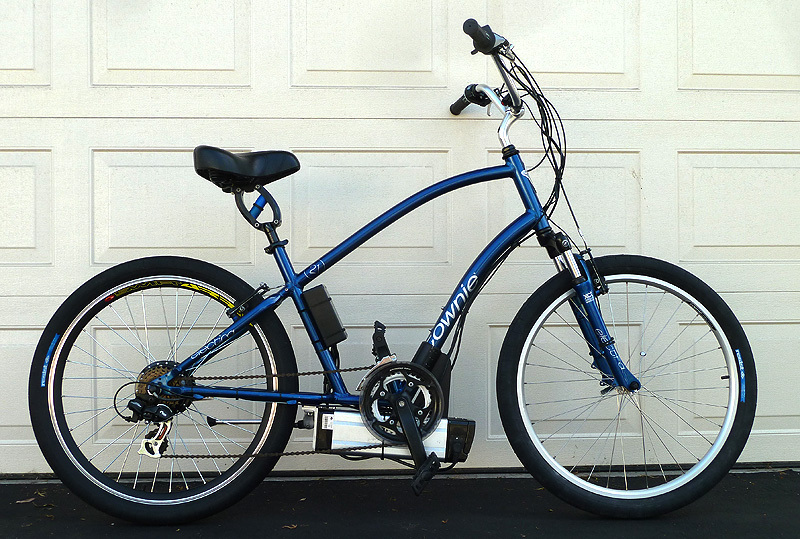 And I built my first electric bicycle – the eCortina v1. 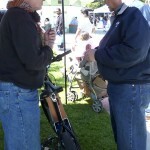 Hope to see you all at Earth Day here in Oxnard, California. I will have the running eCortina and some handouts detailing the project and bike. Looking to connect with some EV guys here in Oxnard and Ventura. 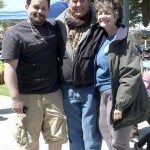 Next weekend (April 16-17) I will hang with my EV buddies from Santa Barbara (www.SBEVA.org) at the SB Earth Day – Green Car Show. The guys will show 2 three wheel electric cars, an electric motorcycle, and of course the eCortina v2 will be there.